EasyEclipse has found a new owner that wants to carry on with the vision of creating Eclipse packages and to develop an interesting funding model for the Eclipse open-source ecosystem. 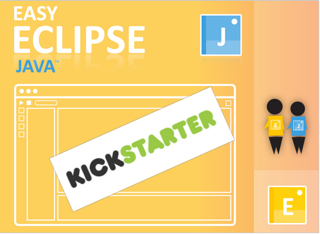 Support the EasyEclipse project on Kickstarter! EasyEclipse packages together Eclipse, the open-source software development platform, and selected open source plugins. We select, assemble, test, patch, build installers and document a full IDE, offered as reliable distributions and plugins. Simple to maintain, without version and dependency issues. After a couple years of silence, EasyEclipse has found a new owner that wants to carry on with the vision of creating Eclipse packages and at the same time wants to give back to the Eclipse open-source ecosystem. Support this project on Kickstarter!!! Retiring EasyEclipse... or passing it on ? There hasn't been much activity from our side on EasyEclipse. In some ways the work of EasyEclipse is now superceeded by the work on distribution that Eclipse itself has been doing. prepackaged editions, ready to install. For Windows, Mac OS X (PowerPC & Intel) or Linux. Copyright © 2003-2008 nexB Inc. All rights reserved.